It is impossible to teach English without classifying vocabulary into groups of words by topic, part of speech, spelling rules and whatnot. By doing so, ESL teachers introduce small and digestible chunks of vocabulary that students can easily remember and use in their communication. 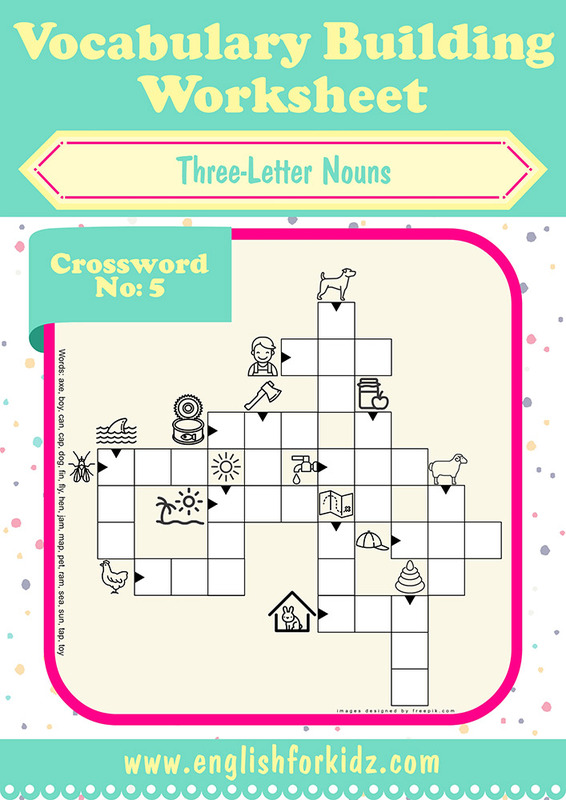 I’d like to share an idea of introducing some of easy three-letter nouns to kids in order to help them build and expand their active vocabulary from early years of studying English. 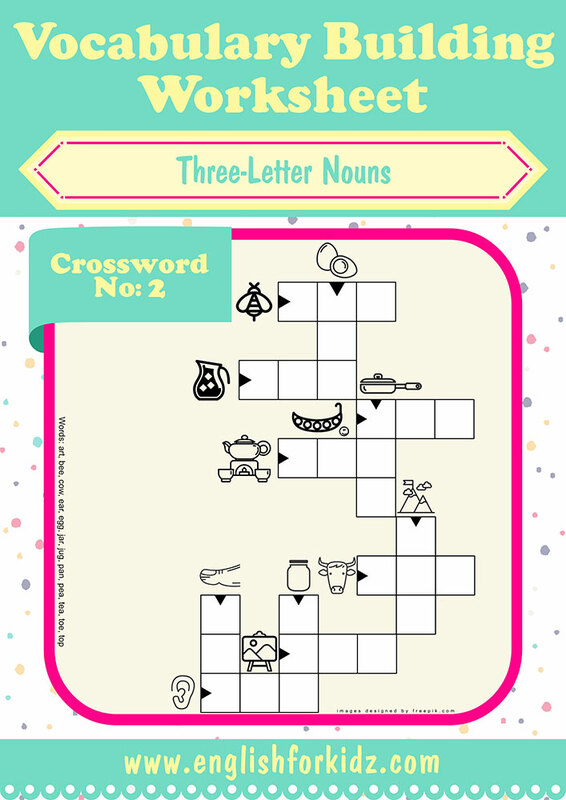 I have created a series of vocabulary building worksheets featuring as many as 80 three-letter nouns. These English words are small and simple enough even for beginners to remember them in no time. 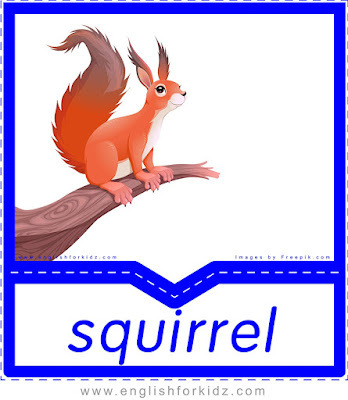 The nouns I introduce are also frequently used ones, so, when memorized, they will constitute a solid part of students’ active vocabulary. 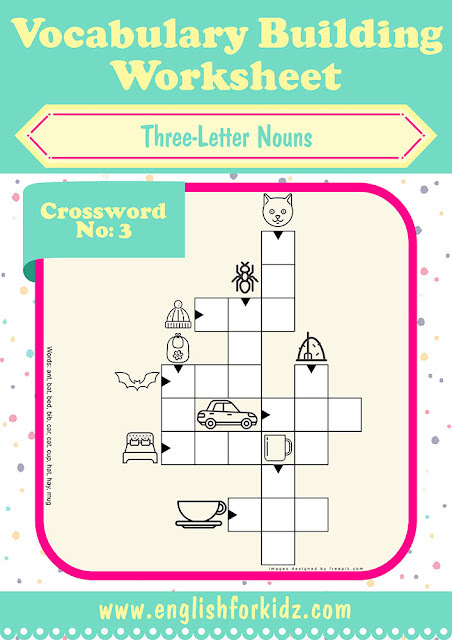 The list of three-letter nouns featured in my worksheets includes the following words: ant, ape, arm, art, axe, bag, bat, bed, bee, bib, bow, box, boy, bug, bus, can, cap, car, cat, cow, cup, dog, dot, ear, egg, eye, fan, fin, fly, fox, hat, hay, hen, hut, ice, ink, jam, jar, jet, jug, key, leg, lip, log, man, map, mat, mop, mug, net, nut, oil, owl, pan, paw, pea, pen, pet, pie, pig, pin, pot, ram, rat, rod, saw, sea, sun, tap, tea, tie, toe, top, toy, van, vet, web, wig, yak, zoo. 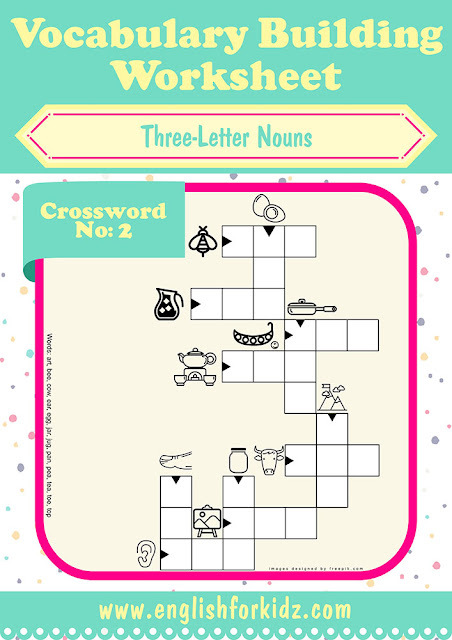 I have designed the set of printable worksheets that helps students memorize the three-letter words through a variety of assignments including crossword puzzles, word search puzzles, word to picture matching and others. With this blog post I’m starting to publish the series of vocabulary building worksheets, flashcards and games I use to teach English to kids. I hope ESL teachers from all over the world will find my teaching materials good enough to be used for their English classes too. 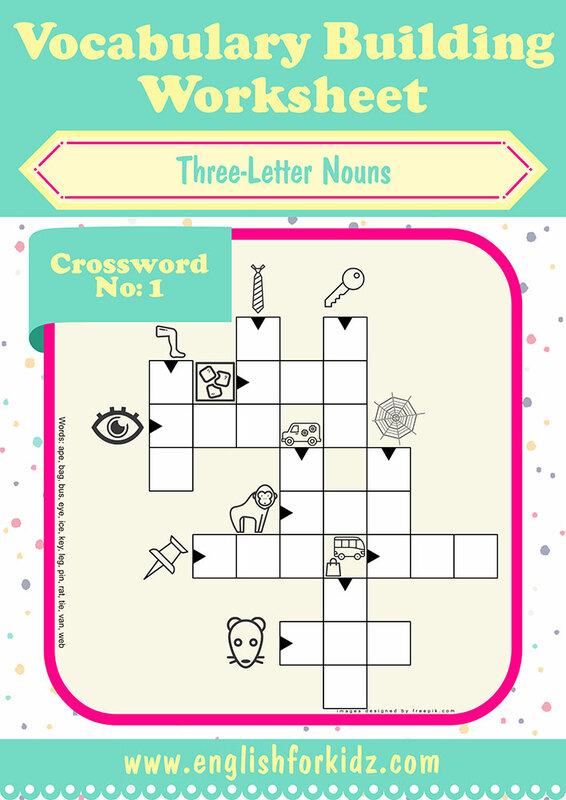 The first post dedicated to vocabulary building exercises features three-letter nouns crossword puzzles. ESL crossword puzzle for words ape, bag, bus, eye, ice, key, leg, pin, rat, tie, van, web. 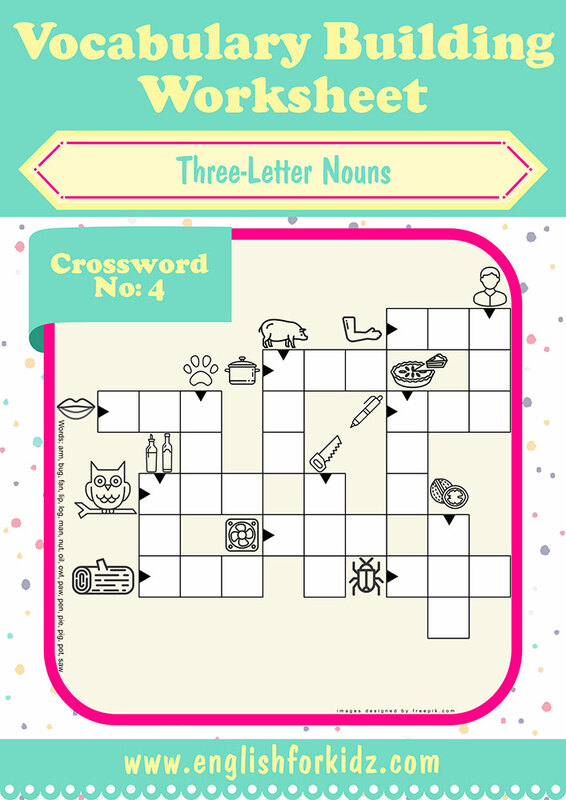 ESL crossword puzzle for words art, bee, cow, ear, egg, jar, jug, pan, pea, tea, toe, top. ESL crossword puzzle for words ant, bat, bed, bib, car, cat, cup, hat, hay, mug. ESL crossword puzzle for words arm, bug, fan, lip, log, man, nut, oil, owl, paw, pen, pie, pig, pot, saw. ESL crossword puzzle for words axe, boy, can, cap, dog, fin, fly, hen, jam, map, pet, ram, sea, sun, tap, toy. 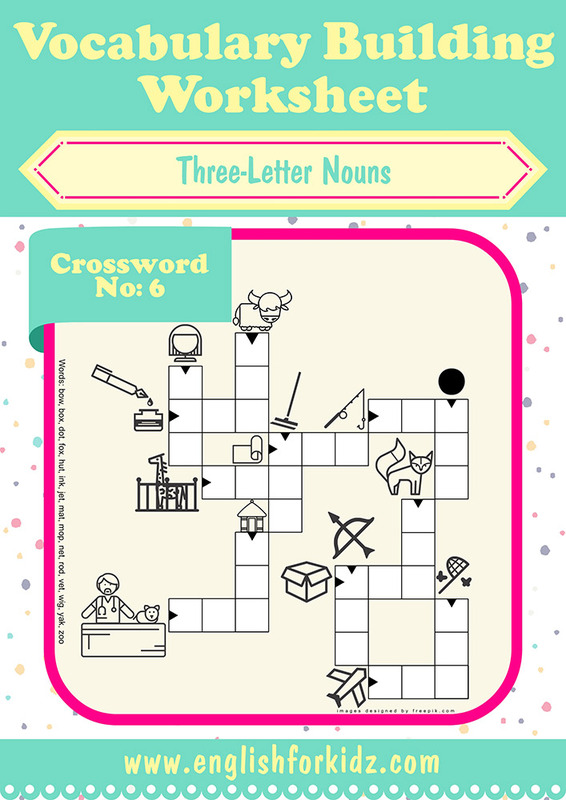 ESL crossword puzzle for words bow, box, dot, fox, hut, ink, jet, mat, mop, net, rod, vet, wig, yak, zoo.